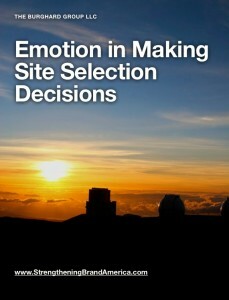 One of the biggest misconceptions is that emotion plays no role in the site selection decision. I have written on this subject previously. What Role Does Emotion Play In The Capital Investment Decision? My experience and research suggests the more important the decision, the greater role emotion plays. Site selection is often a very high profile and costly decision for a CEO to make. As a consequence, the final decision is often made on emotion and subsequently rationalized with as many facts as possible. I decided to summarize my research on emotion in site selection and share it with you. I heard so many stories told by economic development professionals of deals they lost because of a non-data reason, that I knew my experience in the private sector with complex decision-making was replicable. I decided to document what I learned and offer it to you as a free eBook on the subject. I also share some data from a survey of > 1,000 CEOs. The purpose of the survey was to better understand what CEOs feel is important in their deciding where to locate a business operation. It is one of the most comprehensive surveys I have read on the subject, and you may be surprised by the results. All you need to do is click on the eBook cover below to download it. Why Do Other Surveys Claim Emotion Has no Role? Most surveys I have read on what is important in the site selection decision are asked of site selection consultants and not CEOs. Site selection consultants are paid to provide a factual review of the location options on a short-list. To a site selection consultant, numbers are their stock in trade and as a result viewed as what CEOs want in order to make a decision. If you want to know what is important to a CEO, you should ask a CEO. Another reason is that surveys can only provide data on the attributes the survey designer elects to collect information on. The surveys I have read on the subject only look at rational attributes. If you don’t collect data on emotional considerations, it doesn’t mean they are not important. It simply means the survey didn’t collect data on emotional drivers. Consequently, questionnaire design has a lot to do with the results you get. Are You Saying Rational Data Is not Important? That is not what I am saying at all. You need a competitive rational argument for your community to even make the short list of locations under consideration. In many cases, the CEO isn’t involved until the location options have been narrowed to 2 or 3. A senior manager handles the process, or a team of managers is tasked with making a recommendation. But, the site selection process is not a closed bid process. It is designed to ensure the project NPV for the final 2 – 3 location options is roughly equivalent. On a rational basis it doesn’t matter which option the CEO selects. The CFO is going to be happy with any choice. I talk about this further in my post on the Three Moments of Truth. Without a rational basis to differentiate between location options, the final decision is made on an emotional basis. If You Are Right, What Should I Do? A lot of what you are already doing. But, I would recommend you pay more attention to making an emotional connection with the CEO and the team making a final decision recommendation. Take some time with your EDO team and brainstorm ways you can create a positive emotional impression on the decision-maker. Be sure the CEO knows what it is really like to live and work in your community. Provide access to CEOs already doing business there. Explain to the CEO how his/her company will play a key role in creating an even better business climate. Paint a picture of how both the Company and Community will benefit going-forward. Don’t just trust that the impressions you want to make will simply happen. You need to pre-plan and be certain the CEO is provided an opportunity where he/she has experiences to establish that impression. This is work you already know how to do. I am simply suggesting it is more important than you may have thought and may need to be prioritized higher and resourced better. I’d love to get your feedback on the eBook. I’d also love it if you’d share stories of where emotion was the deciding factor for (or against) your community as a location choice. The more stories we can share with each other, the easier it will be to understand the research results. If you had to explain to a CEO how your community can enable achievement of his/her personal ambitions, what would you say? From time ot time place marketers tend to overlook the valuable role that emotion plays in the decision making of their prospective customers. This makes no sense and is like the buyers of new cars relying on a vehicle’s Specifications Manual to base their purchase decision. If emotion plays no role, almost all brochures, advertising, photo images and videos could be removed from marketing budgets because all that will be needed are lists of specifications. Emotion is front and centre in all of our brand strategies irrespective of the size of the community. Among its many roles is to provide filters for the selection of appropriate images to reflect the brand and better connect with prospective customers. I think this ebook provides some great insight and places the site-selection process in a more balanced context. All decisions are ultimately a mix of rational and emotional factors. I wonder how the emotional factors interact with assessments of down-side risk and low-probability events. We know from Prospect Theory and the work of Kahneman & Tversky that most peopole are inclined to overweight the (negative) value of low probability/high value losses. Assuming that the short-list of sites stack up pretty closely on the “rational” data-driven criteria, I suppose much can hinge on the trust in the leadership in the various locations and the perception of the CEO of which group can best protect them from these low-probability, hard-to-predict contingencies that could jeopardize the profitability of their project. Bill – As always you are spot on! 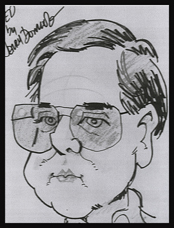 Dan – Great reference. I believe prospect theory is extremely relevant for the capital investment decision. Avoidance of risk is a driver of choice. Economic development professionals need to understand the perceived risks in selecting their community as a location to do business, and have specific strategies in place to mitigate those risks. I do not believe very many EDOs have a clear understanding of what the risks are and how to address them. Bill and Glenn have nailed it – trust the Aussies! The only thing I’d add is that, like cars where most people have a limited understanding beyond basic functionality, so too do they of their destination, even if they’ve been before. This is because each holiday is different and the visitors’ experience depends on their relationship with the destination. After a highly rational information search has narrowed the candidate destination set, an unknowable set of expectations is generated about a holiday, thereby creating a gap. Emotion and imagination tend to be quicker to fill this gap than rational analysis – hence the larger role that emotion plays in holiday decision-making compared to most physical products. Bill’s car analogy is spot on. Deciding on a car or a destination are both high involvement decisions. Typically people use extensive information searching to make their decisions. They will claim they make measured, rational choices because of this. But for cars econometric research has shown that advertising has a far greater impact on actual choice than buyers consciously believe. This lines up with some of the more recent findings in consumer pyschology which see that in many situations people will develop an emotional attachment to a choice based on a simple, often irrational factor. For example, for a product, it could be they like the way it looks (rather than what its technical features), the design or colour of its packaging, or its advertising or imagery its uses. They will then – often unknowingly – gather and filter facts to rationalise to themselves their preferred choice. Destination decisions are arguably made in the same way. Which puts the current reliance on social media into perspective given a lot of what is online is rationally based facts and information. Tom’s point leads to a further consideration. That is the role of emotion in the destination decision-making process for short-haul / domestic travel versus long-haul / international travel. Short-haul travel typically skews to ‘rest and relaxation’ motivations. So, for example, people may want a beach holiday and will – as Tom outlines – search for rational information on various beach destinations. But then, to simplify their choice, will often make their final decision based on an emotional factor which could be just the overall ‘feeling’ they have about a destination. In contrast long-haul travel is typically driven by ‘higher order’ needs such as personal learning and growth or social badging. Also the consideration of international travel leads to a far greater choice set. (Literally any destination in the world can come into play). So people will often construct their short-list of possible destinations based on emtional factors. In fact they may even have a preferred destination in mind without consciously acknowledging this. Then the rational information search comes in to assist in making a final decision. However, based on studies in other similar types of decision making, it can be surmised that they filter the evidence they find based on the emotional connection they already have to the destination(s) in question. That is, they will give more weight to the ‘good’ news they uncover and less to the ‘bad’ news for any particular destination based on how they feel about it prior to going into the detailed research phase. The simplest of practical tests in relation to evaluating the role of emotion in destination choice is the personal one … why are your favorite travel places your favorite places? And in the process thinking a little deeper about the essence of the answers you may find yourself giving. One key element will very frequently be the elusive ‘sense of place’ and distinct sense of ‘local character’ a selected destination offers … not just the activities also found on hand. And the elusiveness of that sense of place is so often intrinsically and closely tied to emotional responses and how that place is affecting many, if not all, of your senses – as you experience it. Sometimes a single element may dominate here but more often a combination of elements – the sum total of a lot of small and possibly big things. Physical, sensory, human, colors, textures, nature-based, culturally-based, ease of access, range of choices, limits to choices, the sense of energy, the sense of peace, etc. All responses defined in very personal and often distinctive ways. Asking myself about what makes for a favored destination, I have one special place which is defined by its particularly intense ‘sense of place’. And the emotional test is that most other people who get to visit it, also feel a pressing need to spontaneously but consciously mention to others how wonderful it feels to be there. Reflecting their and my own bias towards the warm feelings generated by wonderful wildlife filled forests, adjacent to clear surging river waters, with nearby access to historic cabin lodging and a historic general store serving great coffee and sensational freshly cooked scones. All in all a pulpable sense of peace and the emotional relief of leaving the incessant noise of daily life behind. And as a bonus, there are also the visual delights seen while just driving there too. All my own very personal preferences – but all part of what defines the destination’s remarkable ‘sense of place’ and its capacities to evoke powerful emotional responses in me and others. Of course I will return and choose this spot over others, because my emotions tell me to. No scientific studies needed on that aspect! Bruce – Great points re “sense of place”. Your comments compelled me to reflect on a specific community of which I worked. The local EDO understood how to package and effectively market their location’s core essence very well. In thinking through the elements you’ve referenced, it’s evident their strength lies in the ability to combine the key elements of human, culturally-based, the sense of energy and sense of peace all into one unique marketing package. As per your comments, it’s not a single element that “hooks” a positive emotional response from visitors to this location, rather a complementary combination. Also of interest is that there is nothing especially highbrow around their approach to marketing/selling the region to their business visitors. This is a community that simply knows how to offer an authentic and welcoming experience, combined with a sound case re what makes the region a business friendly location. In a similar vein to visitors commenting on the location Bruce reflected upon, several groups of site selection consultants have repeatedly commented on the contented and unique nature of their time in the region. It’s evident that the ability to continually elicit a positive response to this particular region continues to grant the community an “emotional advantage”.